This week arrived with a welcome warmth in the air and daylight that seemingly stretched out for miles, or at least past seven… of course, the asparagus is in full bloom at my local market–all signs that it must be Spring. This week the #SundaySupper crew is embracing its arrival with dozens of Spring-inspired recipes. My contribution puts a seasonal spin on a Genoese classic–Asparagus Pesto with Heirloom Fingerling Potatoes and Orecchiette. Now you may be thinking paste on paste, really? Well, yes, it’s an Italian thing. In fact, one of my favorite dishes is my grandfather’s “pasta e patate”–a dish comprised of little more than potatoes and pasta tossed with sautÃ©ed onions and garlic along with copious amounts of freshly grated parmigiano-reggiano. Oh, and a crank or two of the pepper mill. Simple, satisfying, comfort food. 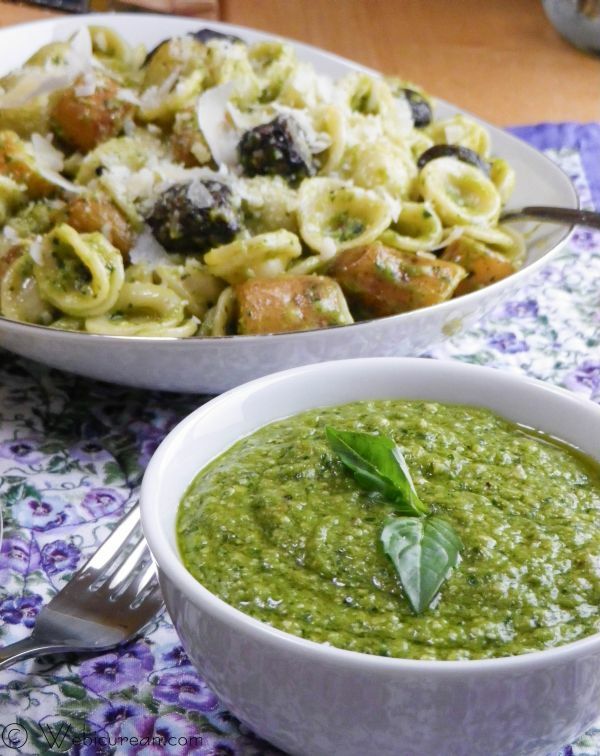 Of course, just about everything can be spiffed up with a dollop of pesto, so this recipe piqued my interest. Adapted from Michael Chiarello’s Tra Vigne Cookbook , this asparagus pesto is a refreshing change-up to the traditional dish–and typical of Chiarello’s signature style. Surely you know him from his TV shows, but around here, Chiarello has been a fixture on the Napa food scene for quite some time. In fact, he was my Aunt June’s long time neighbor. 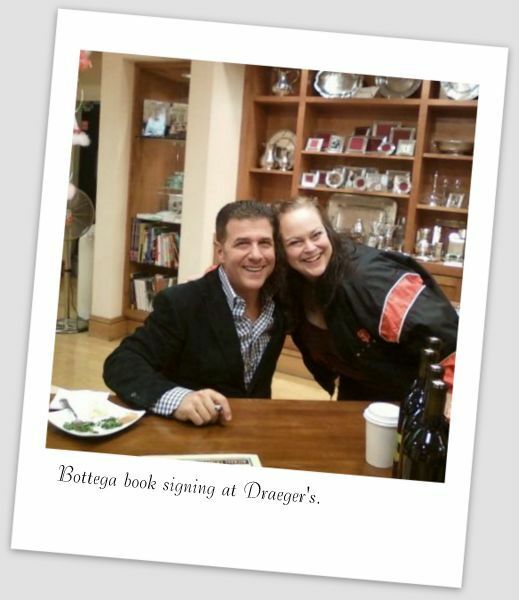 When I connected with him at his Bottega book signing, he shared stories of my late aunt, including times he would bring her fresh-baked biscotti and join her for afternoon tea. I adore that he remembered her so fondly. The pesto recipe is about double the amount you’ll need, but go ahead and make the full batch. It freezes well, so you can pack some up for later or enjoy it slathered on french bread or whatever you fancy. Who knows how much disappeared onto french bread during the making of this post. I also felt compelled to wipe the food processor bowl clean with more bread. It’s really an effective way to soak up every last bit! Is this TMI? 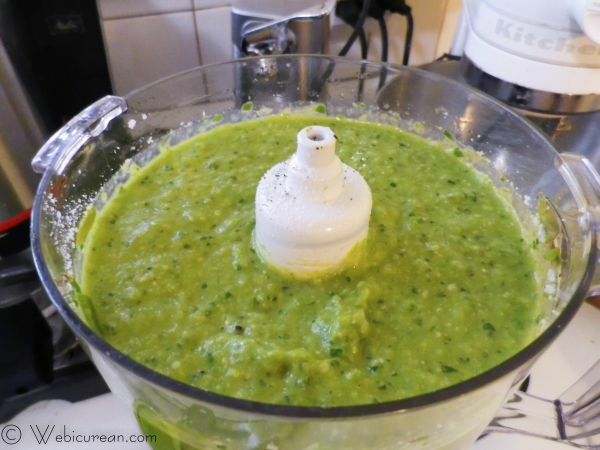 Add the asparagus, basil, pine nuts, and garlic to the food processor, and whirl until well blended. With the processor on, drizzle in the olive oil until it looks like zees. Pulse in the Parmesan along with salt and pepper to taste. Note, don’t go too crazy with the salt as the cheese adds plenty. Refrigerate this until ready to use. Meanwhile, get aÂ pot of salted water boiling and add these babies.Â (You may need to halve some of the larger potatoes.) Cook ’em about 10 minutes or until tender. Drain. Heat up the olive oil in a frying pan, and saute the cooked potatoes until browned and crispy all over.Â While these are frying, cook the pasta and drain, reserving some of the cooking liquid. Toss the pasta and potatoes with about half the pesto and more cheese.Â Thin out with the reserved pasta water if necessary. Salt and pepper to taste. That’s it. Feel free to hoard a big fat bowl for yourself. And save the rest of the sauce for later…. OR grab a loaf of crusty bread and dip away. It’s magical. A seasonal twist on a Genoese classic, this asparagus pesto is perfect when tossed with heirloom fingerlings and Orecchiette. 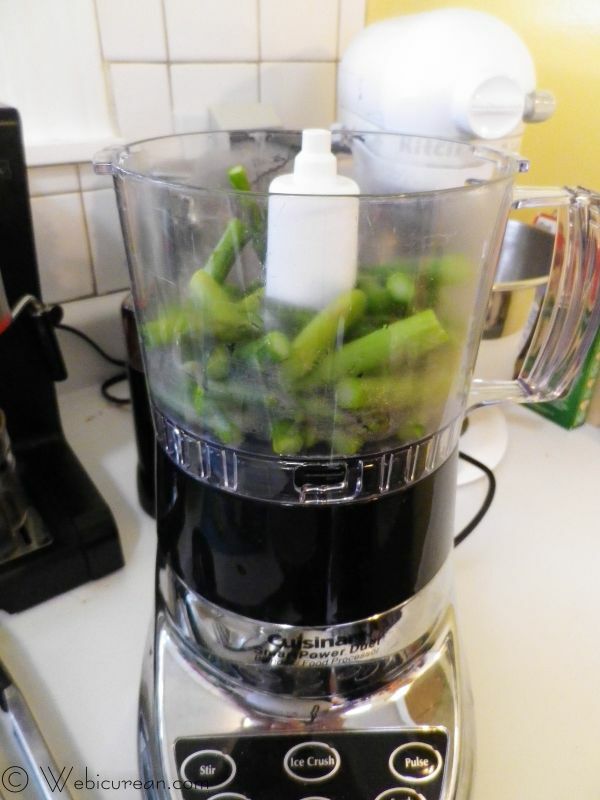 Cut the asparagus into thirds, and add to a food processor bowl along with the basil, pine nuts, and garlic. Whirl until well chopped/blended, then drizzle in the olive oil while the food processor is on the low setting. Blend in the Parmesan using the pulse setting. Refrigerate until ready to use. Halve the larger potatoes, and add to a large pot of salted, boiling water. Cook for about 10 minutes or until tender. Drain. 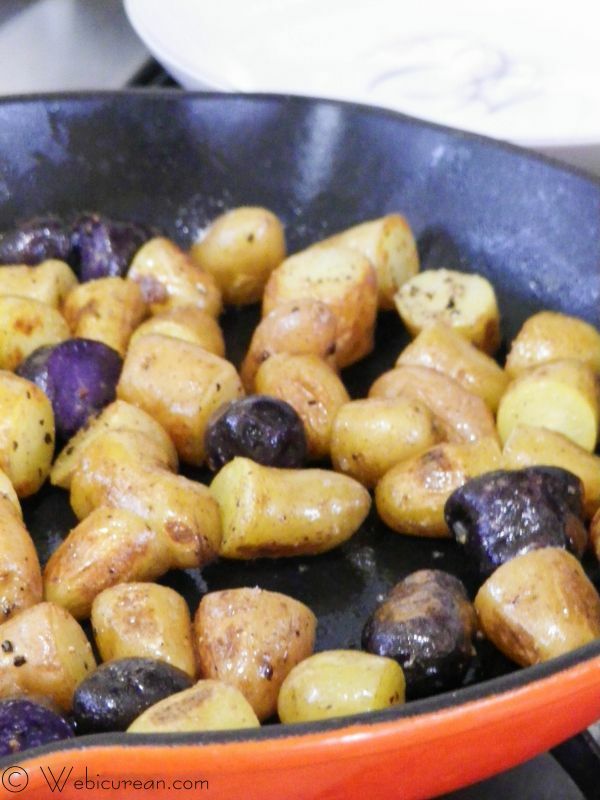 In a medium pan, heat the olive oil over medium-high heat, and add the potatoes, cooking until brown and crispy on all sides. Salt and pepper to taste. Meanwhile, bring a large pot of salted water to a boil, and add the pasta. Cook for about 12 minutes or until done. Reserve about ½ cup of the water before draining. Add the drained pasta along with the crisped potatoes to a serving bowl and toss with about half the pesto and the remaining Parmesan cheese. Use the reserved pasta water to thin out the mixture if necessary. Garnish with additional cheese. This recipe makes about twice as much pesto as you'll need. And it freezes well, so pack up other half for later use. 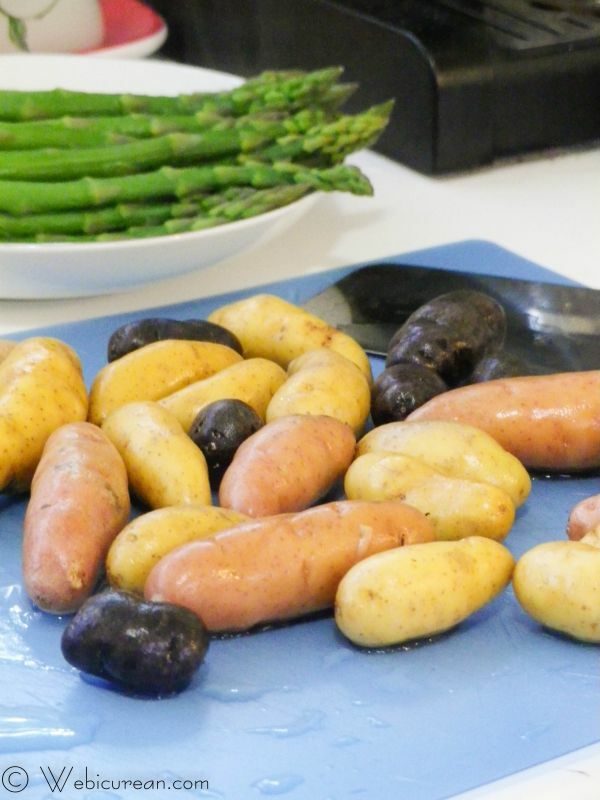 Also, to save on water and time, the asparagus, potatoes and pasta can be cooked using the same pot of water! OK enough about me. Let’s see what everyone else is cooking up today! Please be sure you join us on Twitter throughout the day during #SundaySupper. Weâ€™ll be meeting up at 7:00 p.m. EDT for our weekly #SundaySupperÂ live chat where weâ€™ll talk about our favorite cookout recipes! Note: I earn a modest commission from any purchases made through the Amazon.com links in this post. WOW! Does your recipe look delicious! Appreciate the step-by-step guide, and loving the use of asparagus in so many #SundaySupper dishes! This looks DELISH!! we went to Bottega when we were in Napa and LOVE LOVE his restaurant! I can’t wait to go back! I am LOVING the idea of asparagus pesto. Yum! 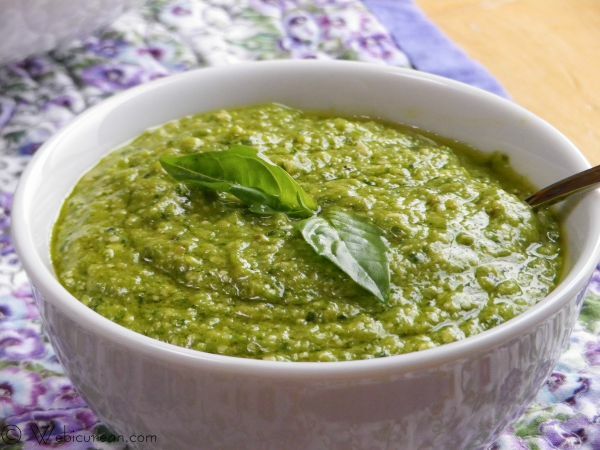 I love any kind of pesto! I can’t wait to try this version! Jen @JuanitasCocina recently posted..Creamy Meyer Lemon Pasta ~ Springtime #SundaySupper! This looks fantastic – just pinned it! And I love your story of meeting Michael Chiarello. OMG, this is the kind of thing I would go make right now for lunch if I had asparagus. I absolutely LOVE it! And so great to have those memories from your aunt. Wow – this sounds and looks amazing!!! I love the asparagus pesto – sounds so good. This dish will make an appearance on a certain supper table in PDX soon 🙂 Thank you and Happy Spring!!! 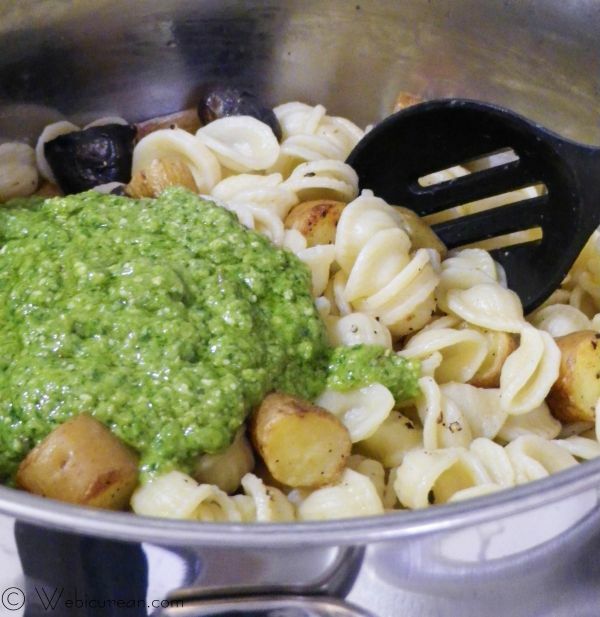 Pasta, Potatoes and Pesto?! This is about to become my new obsession. I can not wait to try this out. Yum! What, What?! Did I just see you make a pesto with my favourite vegetable? This I have to try. This is an absolute beauty of a dish. There are so many good things going on in this post, that I don’t know where to look. I must put this dish on my spring “must-make” list. It’s a meal fit for company! Everything about this is awesome! I would like a big bowl of that pasta please. Can’t wait to make this pesto once I get some asparagus. This looks fantastic! I love the idea of using asparagus in a pesto! Pinning to make this soon!! I love the asparagus pesto! I will have to try this soon! I ate at Tra Vigne back in the 90’s before Chiarello was a fixture on Food Network….and even before I knew who he was. But needless to say, it was a memorable meal! This looks awesome! And I love that you explained the tradition of pasta and potatoes… sounds perfect to me!!! Beautiful photos, and can’t wait to try this. So true, pesto is super versatile and can be used in mutlitple ways as a healthy/ satisfying topping. Your green asparagus pesto caught my eye, now I just need some asparagus to try your recipe with some batate. Thanks fro sharing! I can not tell you how excited I am to try out this asparagus pesto! It sounds fabulous! I love Michael Chiarello1 I watch his show sometimes on the Cooking Channel! 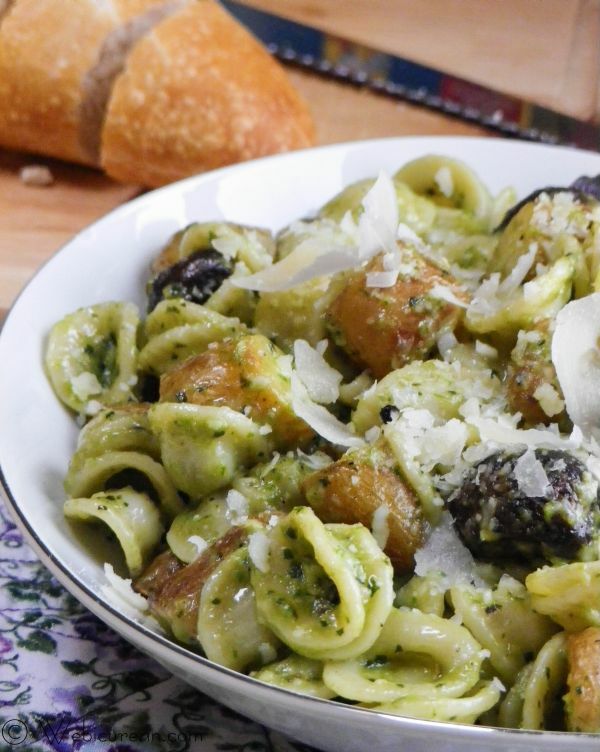 Your Asparagus Pesto & Orecchiette looks amazing, yummmmm! Asparagus PESTO!? How awesome is that! I love orecchiette! It’s one of my newest favorites! Love this! Mmm…that’s some good eating at your house, Anne! I love pesto but have never made it fresh. I love that you used asparagus for this version – what a fabulous idea. I’d have never thought to do that. I need a bigger food processor so that I can make this (mine is only one-cup). And I agree – there’s nothing more satisfying than a big bowl of simply dressed pasta. I wonder if it would add to it if you roasted the asparagus? I bet that would just deepen the flavor–great idea! I love pestos! a new one to try yeah! This looks absolutely delish! Pinning this so I don’t forget for later. I love the way you told step by step. I visited your site for the first time and really loved it. Thanks! One of my favorite cooking books–McCall’s Cooking School–used the step by step method with pictures, which made learning to cook much easier and which inspired me to blog this way!